Much apologies for the hiatus. 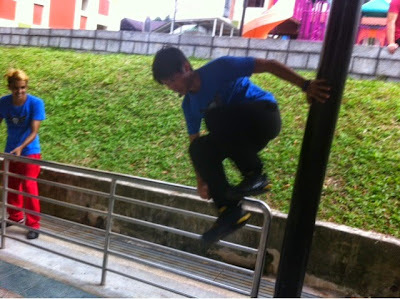 Well, I'm someone who have always been into the dynamics of Parkour - I mean how awesome it is to jump over a railing rather than walking around it . So when Nuffnang opened it to us nuffies this once in a lifetime chance of learning the basics of it with Superfly Monkey Dragons! My fingers went * click click (Register) and noted it down on my calender. 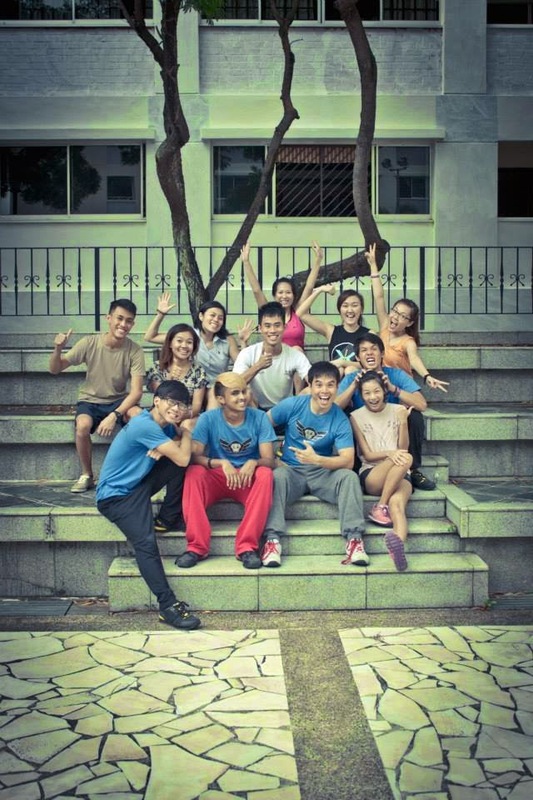 Boy was it an afternoon of sweat and bruises at my first ever Parkour event. And I'm not even talking about the stunts. But just about the warm-up. That day I thoroughly used every part of my muscles. And quite a bit of concentration. fitness, speed and endurance. 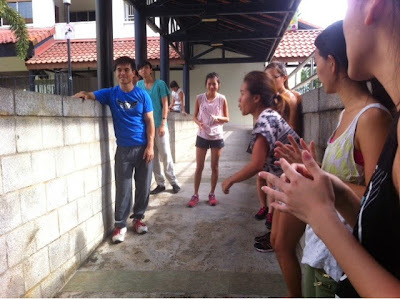 So up the HDB Blocks we went, and next up the stone chairs and everywhere that we could lay our feet on. 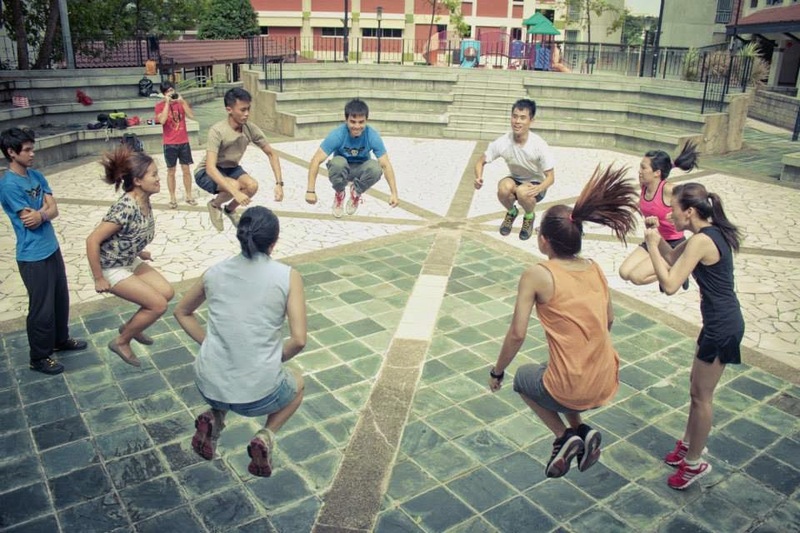 The instructor mentions that it focuses on increasing strength, power and improving coordination and balance. 2. And doing the ice breaker the unusual way. movements together in one graceful movement. Eyes open, closed eyes jumping in tried unison. I loved this the best. With the wind blowing and you concentrating, you begin to hear the rustling of the trees, children's laughter and all within the neighborhood. Finally, stunts and techniques of Parkour to learn. Number 1: Up the wall. 2. Showcase of Girl power - after I complained its difficult for females. - *Who says! 2. Get the footing right and up the wall you go! 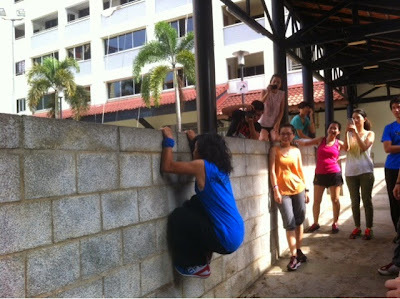 For the boys, our side was too 'chicken feet' so they went to the very high walls to practice. Easy peasy for them it seems. 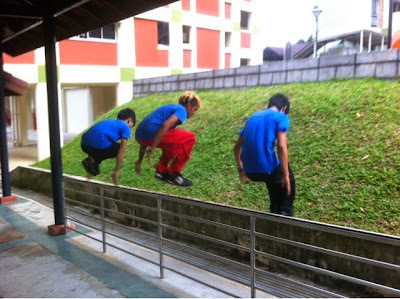 They looked like kung fu masters. haha. 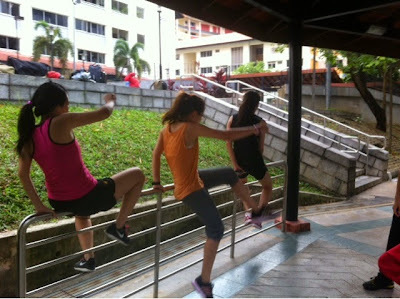 Number 2: Off the railings- Side ways, front wards and backwards roll. With the pros showing us how it could be done. More beautifully. Dear Readers of course, there's opportunity for you to try this good fun 'sport' or should I call it 'art'?